Watch TV for an hour and kill at least 20% of stubborn belly fat? This may seem an impossible promise typical of aggressive sales or marketing people, but Harvard Researchers have proven it to be true. CoolSculpting®, the innovative procedure that safely and non invasively freezes away unwanted fat has won a loyal following.It now dominates the field for non invasive fat reduction at high end medical aesthetic practices in Asia and globally. During this procedure, belly or flank fat is drawn between two panels and cooled, triggering fat cell death, also called “apoptosis”. 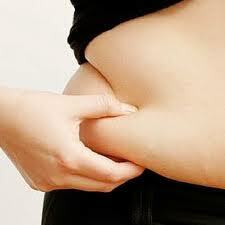 In the days and weeks following the procedure, fat cells are broken down by the body and processed like dietary fat. Over 2-3 months the total count of fat cells and the thickness of treated area are reduced. 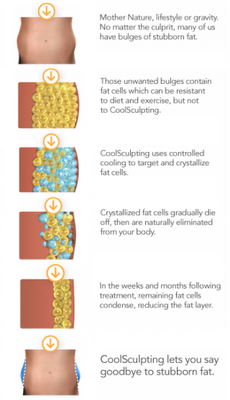 Based on science developed by the Wellman Center for Photomedicine at Massachusetts General Hospital, this breakthrough is based on a vast body of research that demonstrates that fat cells are more susceptible to cold than skin, nerve or muscle allowing CoolSculpting to offer an exceptionally simple, safe and comfortable procedure that permanently destroys fat. Unlike liposuction, CoolSculpting involves no cutting, needles, surgery or downtime. Treatments last one hour, but can be more depending on the number of areas being treated. The procedure is so comfortable it is common for patients to watch TV, read books or play on their phones while CoolSculpting induces fat cells death. While most patients are happy with one treatment, some patients undergo an additional procedure for a more pronounced effect. On average, each CoolSculpting procedure results in an undeniable reduction of fat in the treated area, and patients can start to see results as soon as three weeks following treatment, with the most dramatic results occurring over a period of two to four months in most patients. CoolSculpting is not intended for very thin or very heavy individuals; the best candidates are near their ideal body weight, eat well and exercise regularly, but still have distinct bulges of fat. They are seeking spot reduction for specific areas of fat, but are not considering surgery. 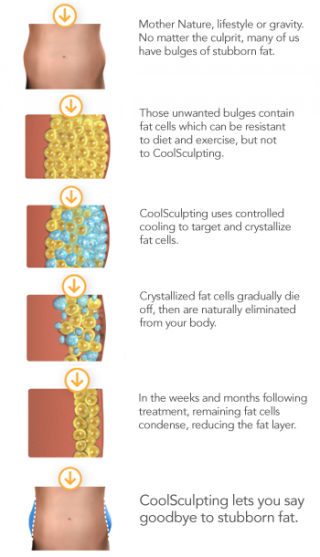 Coolsculpting is the way to go for excess tummy fat, muffin tops and love handles. We've had almost 100% success rate with our patients who have been treated with Zeltiq'sCoolsculpting. hello there i would like to ask about what is the average of total weight loss after treatment?is there any discounts for several parts treatment? Coolsculpting is not for total weight loss as it does not tackle the body's fat burning capacity nor the overall excess body fat. Coolsculpting is for excess fat in certain areas or "targeted" fats and these are usually in the abdomen, thighs, waistline and back. For charges or any offers, please call our En-hanze Centre at 1300-88-1788.